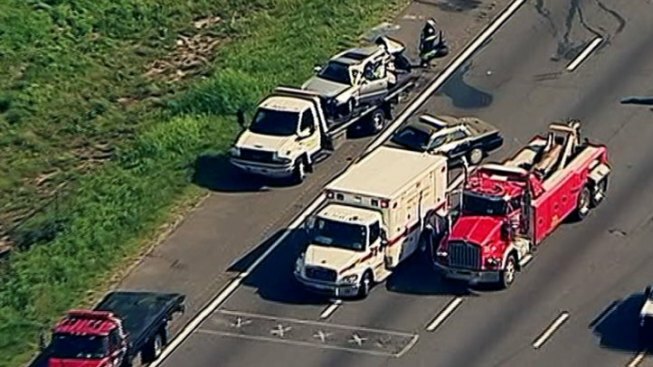 Most lanes of the Capital Beltway's Inner Loop are shut down after a multi-vehicle accident around 8:30 a.m. Thursday. As many as 11 vehicles may have been involved. There is no word on injuries yet. One person was reported to have been rescued from a vehicle. Maryland State Police are on the scene, near Exit 13 at Ritchie Marlboro Road. All lanes on the inner loop were briefly closed. Traffic was getting by in the left lane and on the shoulder as of 9:20 a.m. Traffic was reported to be backed up from Route 202. The closure comes hours after another accident, this one fatal, shut down the Inner Loop near the Branch Avenue exit in Prince George's County. In that incident, officers were called to a crash involving two motorcycles and two vehicles just after 12:30 a.m. Thursday. During the chain-reaction crash, both motorcycle drivers were ejected from their bikes. They were taken to an area hospital, where one driver, Marshall Omar Cooper of Lothian, Md., was pronounced dead. The other motorcyclist is in serious condition. Maryland State Police diverted inner loop traffic off the beltway at Allentown Road for more than five hours while an accident reconstruction team investigated at the scene. The State Highway Administration said all lanes have reopened in that area, although there could be some residual delays. Stay with NBCWashington on-air and online for updates to this developing story.